Global warming? … too simple. The planet faces complex and chaotic changes that will make some areas periodically colder. How about climate change instead? Pollution? … too broad. Not all pollution causes climate change. Let’s talk carbon emissions. Clean energy? … what does that even mean? How about sustainable, renewable, carbon neutral? Fuel efficiency (or fuel economy) is the next term to need urgent rethinking. All fuels are not created equal, and modern vehicles are efficient in very different ways. We need carbon efficiency to evaluate the true impact of modern technologies and fuels. To an engineer’s mind, fuel efficiency measures how much fuel it takes to do work. Since a car does work by driving somewhere, better fuel efficiency means that it takes less fuel to get where you’re going. It also means that it costs less money to get there, which eases the strain on your pocketbook and greatly improves your outlook on going anywhere in the first place. And, that is exactly what fuel efficiency is intended to do. Fuel efficiency acts primarily as a financial yardstick, encouraging consumer confidence in the automotive industry and boosting sales. It measures the expense of owning a vehicle—not emissions, not effect on climate change, not even the operation of an engine. Expense. Fuel efficiency took the national stage during the Eisenhower Recession of 1958. To energize the faltering U.S. auto industry, Congressman Almer Stillwell “Mike” Monroney sponsored the Automobile Information Disclosure Act (AIDA) mandating that all new vehicles display financial information on a window sticker in the dealership. “Monroney Stickers,” as they were known, attempted to rebuild trust in fast-talking car salesmen by displaying financial information in black and white for all to see. For the first time, listed boldly with the price, fuel efficiency became a selling point for a vehicle: it measured the long-term cost of ownership. After all, if you bought a cheap car that turned out to be a gas-guzzler, the cost would catch up with you in the end. Fuel efficiency remained a twinkle in a salesman’s eye until the APEC oil embargo of 1973. With severely limited access to fuel, Americans discovered that they cared a great deal about how much fuel their vehicles burned. Months of gasoline shortages, price gauging and hour-long waits at the pump convinced congress to pass the Corporate Average Fuel Economy (CAFE) standards in 1975, creating the first government mandates for fuel efficiency. The APEC Oil Embargo left Americans scrambling for fuel and pouring every last penny into their gas-guzzlers. CAFE standards made fuel efficiency a national security issue. In order to protect America from future embargoes, vehicles would have to economize and burn less fuel. Fuel efficiency became fuel economy: the fight for more miles per gallon. The momentum of this fight propelled fuel economy into a new domain of national security as the threat of climate change solidified in the 1980s. Scientists sounded the alarm, pointing to global warming as an immanent danger to America and the world, and grasping around for anything that might limit fossil fuel emissions. They seized on CAFE standards as the first line of defense. CAFE standards already limited fossil fuel consumption—and less consumption meant fewer emissions—so leveraging CAFE standards seemed like a quick and dirty fix until new technologies could take over. The mechanism was already in place, and the solution was simple. It was simple, that is, as long as the government could find the moxie to stand up to the U.S. automotive industry. But, lawmakers dithered and dodged, and CAFE standards languished in committee, prompting outrage from the scientific community. The fight for more miles per gallon became a frenzy. Scientists and activists took up fuel economy as their battle cry. The battle to stop climate change became a battle to impose regulations on the auto industry in a desperate attempt to save the planet. Our security was at stake, not just as a nation, but as a species. Faced with such dire consequences, consumers embraced fuel economy as their own personal statement against climate change. Efficient vehicles came to represent a conscious choice to save the planet, and the term fuel economy took on yet another meaning. It still meant cost. We still cared how far we could get on a gallon of gas, and picked vehicles based on their long-term costs, but choosing a vehicle now meant choosing whether or not to make an impact on climate change. 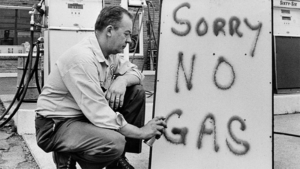 Fuel economy had become a measurement of environmental action and politics. Which worked fine as long as fuel economy actually measured a vehicle’s effect on climate change. When scientists first called for an increase in CAFE standards, all vehicles were the same and burned the same kinds of fuel. Fuel economy was a logical choice. But, modern vehicles have changed. They employ new technologies against climate change. Today, vehicles run on myriad fuels, some of which have categorically different consequences for climate change. Can an economic incentive from 60 years ago, with a compound, complicated and political meaning, still measure climate change impact? Its scope is limited to vehicles that burn petroleum fuels. Can fuel economy still guide smart choices against climate change? What about biofuels? What about electric vehicles? What about hydrogen fuel cells? Fuel economy misses the mark on all counts. One of the mantras of climate change activism is that carbon emissions are bad. Really bad. Maybe evil. Because carbon causes climate change. That mantra is wrong, not all carbon emissions are bad. Not all carbon causes climate change. Our planet has a natural carbon cycle that continuously releases and reintegrates carbon, moving it through the rocks, oceans, atmosphere and life, and creating earth’s hospitable climate along the way. Earth would be a lifeless frozen wasteland without this carbon, and none of us would be here to worry about anything at all, never mind the climate, without it. This necessary and natural carbon is green carbon. It exists as carbon dioxide in the air, calcium carbonate in the oceans, the carbon-based cells and structures in living creatures—and in biofuels. Biological fuels come from biological sources, sources composed of green carbon belonging to the carbon cycle. Any number of fuel crops are excellently suited to American climates, but the U.S. subsidizes corn, a terrible source of ethanol. The green carbon in biofuels starts off as carbon dioxide, gets absorbed by growing plants, is harvested, made into fuel, and then returns to the air as carbon dioxide again when it burns. Biofuels form a continuous cycle, from carbon to life to carbon again. The green carbon in biofuels adds nothing new to the atmosphere. It was already a part of the carbon cycle and the earth’s climate when it was made, so it does not cause climate change. Biofuels are made of green carbon that already belongs to the climate. What’s more, our vehicles can already run on them. He was right. The “fuel of the future” is at our fingertips. The physics behind our internal-combustion engines has not changed since the Model-T. Our cars can still run on green-carbon biofuels. Biofuels currently come in two flavors, though so-called “drop-in fuels” are on their way: The green-carbon replacement for gasoline is ethanol. The green-carbon replacement for diesel is biodiesel. Ethanol is ethyl alcohol, the same kind of alcohol humans enjoy drinking, especially on spring break. Ethanol contains more oxygen than gasoline and combusts faster, so vehicles require a cheap adapter to compensate. Hence the term “flex-fuel vehicle,” and the need for marketing firms to invent a distinction (the Model-T had manual controls that allowed it to switch between fuels). The adapter allows you to mix any amount of ethanol with gasoline. Use one hundred percent gasoline, one hundred percent ethanol, or anything in between, your vehicle will purr like a kitten. The adapter has you covered. Diesel vehicles can run on green-carbon biodiesel right now. Skipping a lot of chemistry, biodiesel is vegetable oil that has been thinned with alcohol so that it does not need to be heated to combust. It can be poured right in to the fuel tank, where, for other chemical reasons, it will likely make the vehicle run better than it ever did on diesel fuel. It might be the simplest and most effective choice you can make to fight climate change. But all this fuel mixing presents us with a different problem: biofuels contain green carbon that does not cause climate change. Fossil fuels contain fossil carbon that threatens life on earth. If you mix them, how do you measure your car’s impact on climate change? How do you choose between vehicles or fuels in the dealership? Let’s start by whittling down the various meanings of fuel economy to the most mechanical and primary: fuel efficiency measures how much fuel it takes to get somewhere. Period.We do not care about cost, for instance, although the cost of biofuels does not depend on the price of oil, so biofuels are often cheaper than petroleum fuels. For the moment we will ignore anything so petty as cost. Onward for science! Next, let’s deal with the true cause of climate change: fossil-carbon emissions from fossil fuels. So, the two things we care about are: 1) how much fuel it takes to get somewhere. 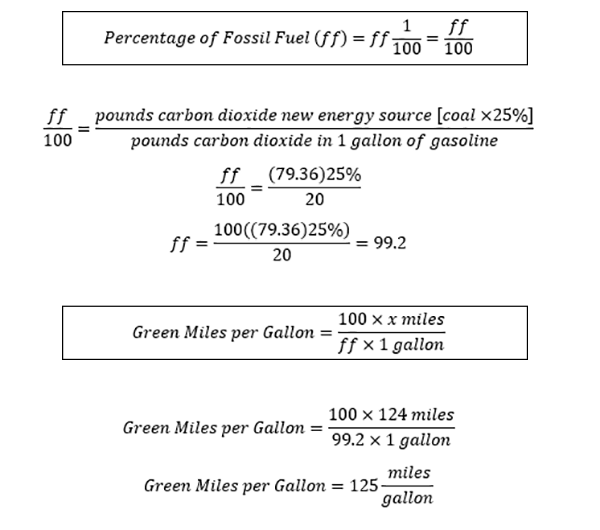 2) the fossil-carbon emissions of getting there. Calculating fuel efficiency through these two lenses gives us carbon efficiency. 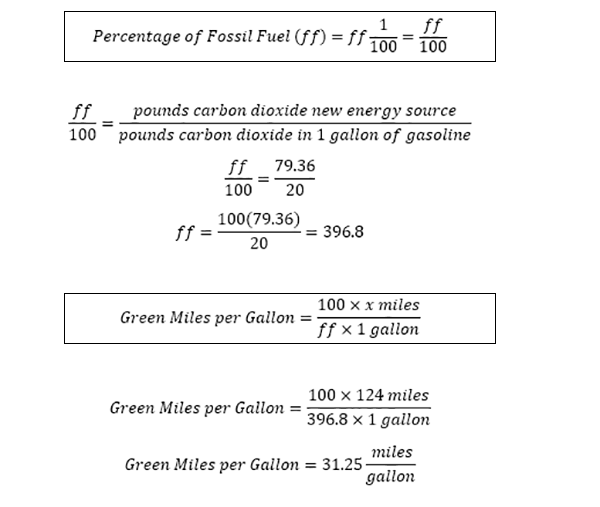 Carbon efficiency measures how far a vehicle can drive before burning an entire gallon of fossil fuel, since fossil fuel is the problem. Sound familiar so far? 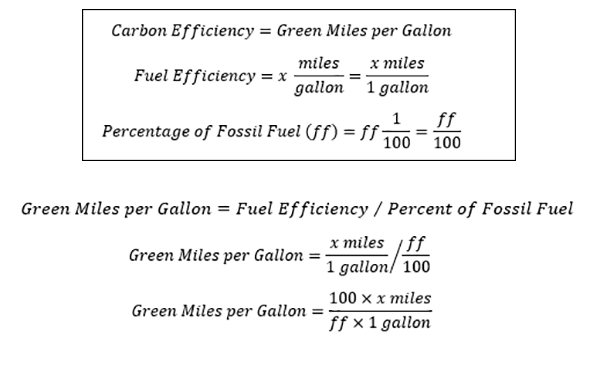 It should: carbon efficiency looks the same as fuel efficiency when running on 100% fossil fuel. Every mile that your car drives on fossil fuel releases 100% fossil-carbon emissions. What about other fuels? If you fill your car up with a mixture of green-carbon biofuel and fossil fuel, it can go much, much farther before burning a gallon of fossil fuel because every mile that it travels on biofuel does not affect the climate. Biofuels are a climate change freebie. How much farther? 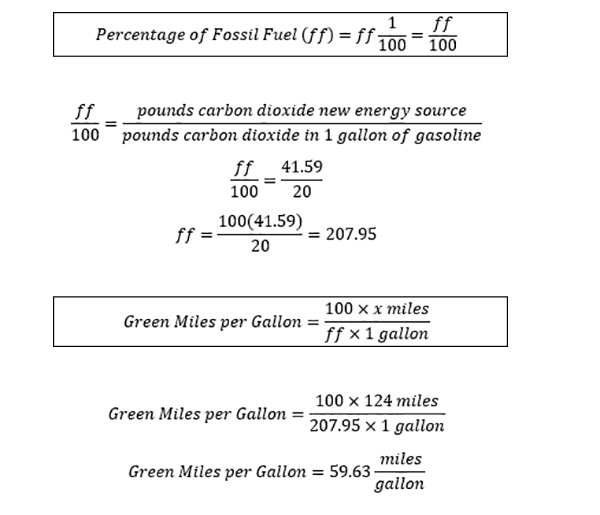 We need a measurement of distance per unit of fuel like miles per gallon—but only distance per unit of fossil fuel. Let’s call it green miles per gallon, and do some calculating. How far can we go on a blend of ethanol and gasoline, for instance? This is not a hypothetical assessment. 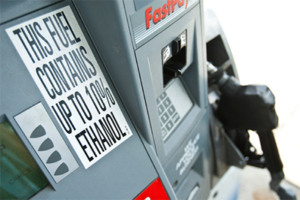 Most retail gasoline already contains about ten percent ethanol. 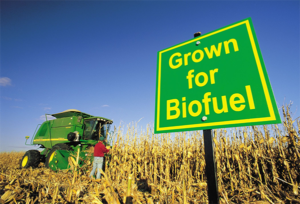 Unless you hunt for gasoline sans ethanol, your vehicle probably has biofuel in it right now. What does that do to your carbon efficiency? Let’s assume that your car has a fuel efficiency rating of 30mpg. Your engine will take you thirty miles on one gallon of fuel. Already when you buy gasoline, ten percent of what you put in your tank is green-carbon ethanol. That means that when you go thirty miles on a gallon of fuel, only 90% of what you burn is actually gasoline, the other ten percent is ethanol, and does not increase climate change. In an effort to decrease U.S. fossil fuel emissions, most commercial gas already contains 10% ethanol. Since a full ten percent of the gas you buy at the pump is already a freebie, you can drive ten percent farther before you burn a full gallon of gasoline. Ten percent of 30 miles is 3 miles, so already, without changing a thing, you have been achieving a carbon efficiency of 33gmpg in your existing vehicle. Your carbon efficiency is already ten percent better than you thought when you bought gasoline at the pump. Pretty sweet! In fact, your impact on climate change with biofuels is a numbers game. The greater the percentage of biofuel vs. fossil fuel you use, the better your carbon efficiency, and the more miles you can travel before burning up a gallon of gasoline. Want to get 40gmpg? Fill up with 25% ethanol and 75% gasoline. Want to get 200gmpg? Just fill up with a widely available blend of 85% ethanol, 15% gasoline (called E85) at your local gas station. You would need to drive 200 miles before finally using up one gallon of gasoline. Your carbon efficiency equals 200 green miles per gallon. Compare that to a hybrid. The industry’s best hybrid has a fuel efficiency rating of 47mpg. 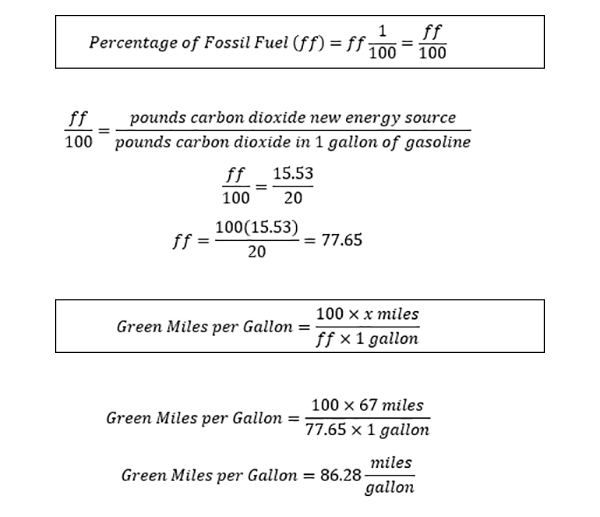 Accounting for the ten percent ethanol in commercial gasoline, that hybrid’s carbon efficiency hits 52gmpg. Not bad, but if you filled up your old 30mpg hooptie with 85% ethanol (E85) instead of gasoline, your carbon efficiency soars to 200gmpg. 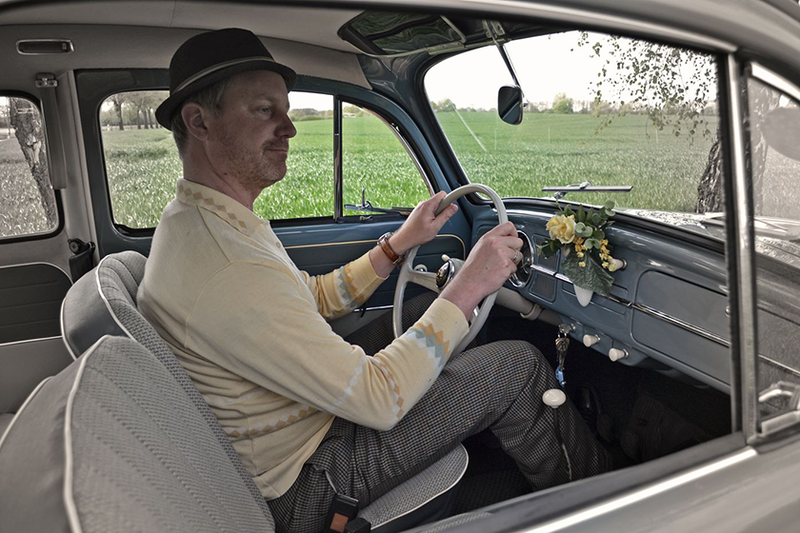 Your jalopy becomes four times better for the climate than the most advanced hybrid on the market. Our metrics have been all wrong for judging climate change impact. Don’t run out and fill up your tank with E85 yet. You will need that adapter to change your car back into a flex fuel vehicle (we aren’t as forward-thinking as the Model-T anymore). You would need to drive 2000 miles before releasing a single gallon of fossil fuel emissions into the atmosphere. Your giant truck, with the reputation of a dirty climate change catastrophe, achieves 2000gmpg running on 99% biodiesel. This is not a fantasy. Across the country biodiesel providers routinely offer 99% biodiesel, 1% diesel (B99) for little more than the cost of regular diesel. Want your truck to be forty times better for the climate than a hybrid? Learn what you can about biodiesel, warranties and winter driving and then fill up with B99 today. Our reliance on fuel economy has blinded us to the true impact of our vehicles. Carbon efficiency illuminates their actual effect on climate change, and completely upends traditional assessments of green vehicles—especially our assessments of fancy new technologies. 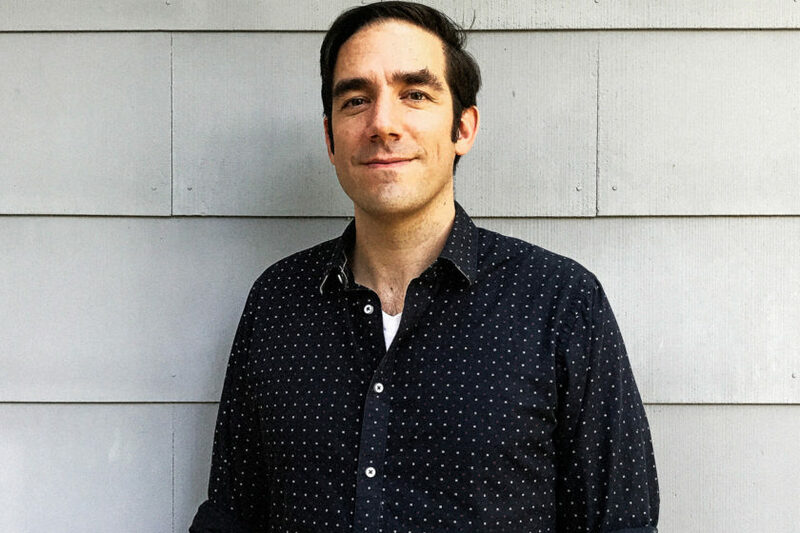 Hybrids have taken a beating in this assessment, not because there is anything wrong with them—they represent a conscientious effort to improve upon existing technology purchased with the best intentions—but to illustrate the need for different standards to assess climate change, especially in terms of new technology. The source of energy remains of utmost importance when considering new tech. Electric cars offer a perfect example. The EPA has adopted its own standard to measure the efficiency of electric cars: the miles per gallon gasoline equivalent or MPGe (sometimes presented as the MPGge). Every new electric car sold in the United States must display its MPGe rating on a Monroney Sticker in its widow. The MPGe provides an equivalent between gasoline and the electricity used to charge a car’s batteries. This yardstick is, if nothing else, very scientific. Scientists working for the EPA first measured the average amount of energy released from combustion of one gallon of gasoline. They then charged a vehicle with precisely that amount of energy, measured how far it could travel, and gave it an equivalency rating in MPGe.The EPA determined that 33.70 kilowatt-hours (kW•h) of electricity equaled the amount of energy in one gallon of gasoline. Monroney Sticker for a BMW i-3, focused entirely on cost. This sounds good, but once again, this produces an equivalent of fuel economy, which means cost. The miles per gallon gasoline equivalent rates how much it costs get from one place to another, not a vehicle’s effect on climate change. You can see it right on the sticker. 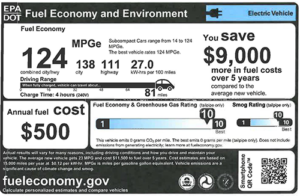 All EPA mandated MPGe notifications reveal how much money an electric vehicle will save you over the course of five years and the annual fuel cost as you go—not surprising, since Monrony Stickers are all about the money. MPGe means fuel economy, which means cost, not climate change, but even these cost-based ratings are misleading. The MPGe efficiency ratings omit the fact that within ten years all the batteries in an electric car need to be replaced, at a current market price of roughly $7,000. So, you may save thousands over the course of ten years, but much of that will need to be spent on new batteries in the near future. It turns out you haven’t saved much money in the long run buying an electric vehicle, an ironic miscalculation considering that the purpose of fuel efficiency (or its equivalent) on Monroney stickers is to disclose future costs. Of course, most people don’t buy electric cars for financial reasons, they buy them to stop climate change, and carbon efficiency is where MPGe ratings fall spectacularly short. The problem is the source of your electricity. Climate change occurs from the release of fossil carbon into the atmosphere. One gallon of gasoline releases roughly 20 pounds of carbon dioxide (CO2) when it burns.The CO2 weighs more than the gasoline because each atom of carbon joins two heavy oxygen atoms, making the whole much heavier than the carbon alone. But, if your electricity comes from a coal fired power plant, making the precise amount of electricity as the energy in a gallon of gasoline releases 73.26 pounds of CO2—almost four times as much carbon as a gallon of gasoline. And, that is only if you live close to the plant. Electric utilities lose an average of 8.33% of generated electricity to the energy grid, meaning that it takes an extra 8.33% of coal to charge your batteries. So, electric utilities actually release of 79.36 pounds of carbon dioxide to generate the same amount of energy in a gallon of gasoline—a full four times the CO2 produced by a gallon of gasoline. Your vehicle’s carbon efficiency falls dramatically to account for so much more fossil carbon. In the end, driving the best-rated electric car on the market, with an efficiency rating of 124MPGe, releases as much CO2 as a gallon of gasoline after only 31.25 miles when charged with electricity from coal. Your luxury electric car tops out at a carbon efficiency of only 31.25gmpg—slightly better for the climate than the average gasoline car, but significantly worse than a hybrid. This is a worst-case scenario for the source of your electricity. Most utility companies use a mix of coal, natural gas, and renewable sources to generate electricity. The EPA provides a handy profiler to match your utility with its energy sources.The national average is 1.14 pounds of CO2 per kWh, adding up to 41.59 pounds of CO2 per 33.70 kWh, including losses to the energy grid. The emissions are in yearly amounts, so divide them by 12. On average across America, your top-of-the line electric car would achieve 59.62gmpg when you charge it at home—better than a hybrid, but little less than half the 124 MPGe rating you bought it for. Your climate impact depends on the source of your power, and carbon efficiency reflects that source. For instance, if you enrolled with one of the many renewable utility partners available throughout the country, and generated, say, 75% of your electricity through solar or wind, only 25% of your electricity could come from coal. That immediately elevates your carbon efficiency to 125gmpg, right around the 124MPGe efficiency rating on the sticker. The more renewable electricity you use, the better your carbon efficiency, the better your electric car is for the planet. New technologies urgently need carbon efficiency ratings. The introduction of hydrogen fuel cell cars immediately raises questions about their impact, and the impact of hydrogen as a fuel source. Hydrogen fuel cell vehicles break apart hydrogen to charge a battery, powering an electric motor. When hydrogen burns (or generates electricity), two hydrogen atoms combine with one oxygen atom to create water (H2O), meaning that hydrogen fuel cell vehicles leave a trail of pure water behind them. Nothing else. You could drink their exhaust. Pretty cool, but where does the hydrogen come from? Does it create any fossil fuel emissions? If so, how much? The best fuel cell car on the market has an efficiency rating of 67MPGe—but that only tells us about the cost to drive it, not its impact on the climate. The easiest way to make hydrogen, and the lion-share production method at this stage, is to harvest hydrogen from natural gas. The EPA’s chemistry tells us that obtaining hydrogen from natural gas releases 15.53 pounds of CO2 for the amount of energy equivalent to the energy in one gallon of gasoline. MPGe equivalency for hydrogen is 1.011kg = 1 gallon of gasoline Steam-methane reforming reaction CH4 + H2O (+ heat) → CO + 3H2 A highly endothermic reaction, requiring ΔHr= 206 kJ/mol. Assuming natural gas is used as a source of heat, this ...continue So, harvesting hydrogen from natural gas releases a little more than three quarters the CO2 of burning a gallon of gas. That sets the fuel cell’s carbon efficiency at 86.28gmpg, a third more than its MPGe rating. And, there are other ways of producing hydrogen that do not cause climate change at all—electrolysis and biogas are two—that would send its carbon efficiency through the roof. Once again, the source of fuel is much more important than the efficiency of an engine. While 86.28gmpg is better carbon efficiency than a hybrid, it doesn’t come close to the carbon efficiency of running a diesel on biodiesel. A car can emit nothing more harmful than water and still be worse for the planet than a stinking, polluting, gas-guzzling diesel truck. Carbon efficiency standards eliminate this confusion. Fossil carbon causes climate change no matter what form it takes, or at what stage along the way we harness its power. Our cars can cause climate change even if the source of their emissions is hundreds of miles from us, or they emit nothing more harmful than water; while the exhaust coming out of our vehicles can look and smell as bad as diesel fumes and consist of 100% renewable green carbon. Let’s look beyond our immediate experience and see the source of our fuel. Green miles per gallon provides a universal carbon efficiency standard, allowing us make real choices to save our planet. With the right information, the choice is easy. Let’s make that choice together. 1. 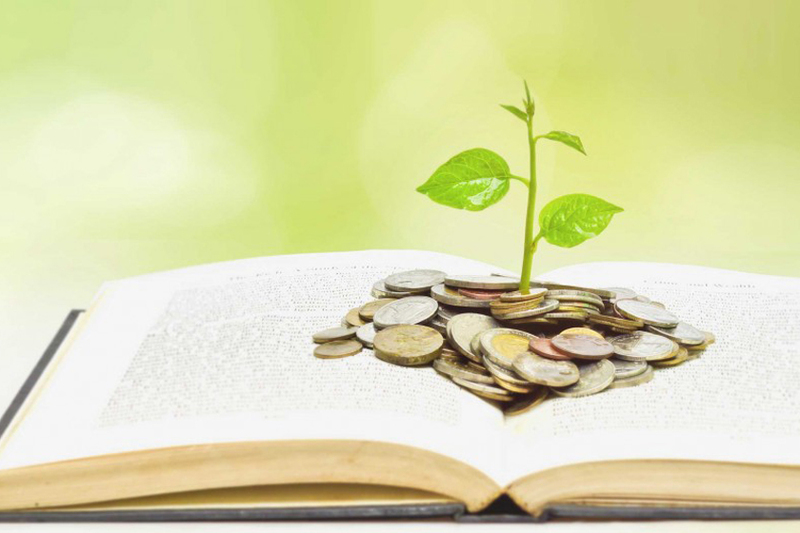 ↑ We do not care about cost, for instance, although the cost of biofuels does not depend on the price of oil, so biofuels are often cheaper than petroleum fuels. For the moment we will ignore anything so petty as cost. Onward for science! 7. ↑ The EPA determined that 33.70 kilowatt-hours (kW•h) of electricity equaled the amount of energy in one gallon of gasoline. 8. ↑ The CO2 weighs more than the gasoline because each atom of carbon joins two heavy oxygen atoms, making the whole much heavier than the carbon alone. 10. ↑ The national average is 1.14 pounds of CO2 per kWh, adding up to 41.59 pounds of CO2 per 33.70 kWh, including losses to the energy grid. The emissions are in yearly amounts, so divide them by 12. A highly endothermic reaction, requiring ΔHr= 206 kJ/mol. Assuming natural gas is used as a source of heat, this reaction would release an additional 0.027lb/mol CO2, for a total of an additional 3.36lb per 1.011kg hydrogen. A slightly exothermic reaction, releasing ΔHr= -41 kJ/mol, probably unused and released as heat. How could the EPA have been wrong all of these years? i mean, i get the history but geez. U need to get them woke!! Household fuel efficiency If your household has two cars and one is used mostly for commuting, make the commuting car a real gas sipper if you can’t for both. But electric cars won t drive the change until the direct costs of buying and running the things is cheaper for individuals, including the costs they pay as levies and taxes for so called green energy.